An unfinished CG from 2014 that I went back in finished up recently. One of a few things from that year that I'm going back and not only finishing but also polishing up to meet my current quality standard. It's intended to be a remake of this CG. Info on Nadare, and more later. But for now here's some info on the Reapers. 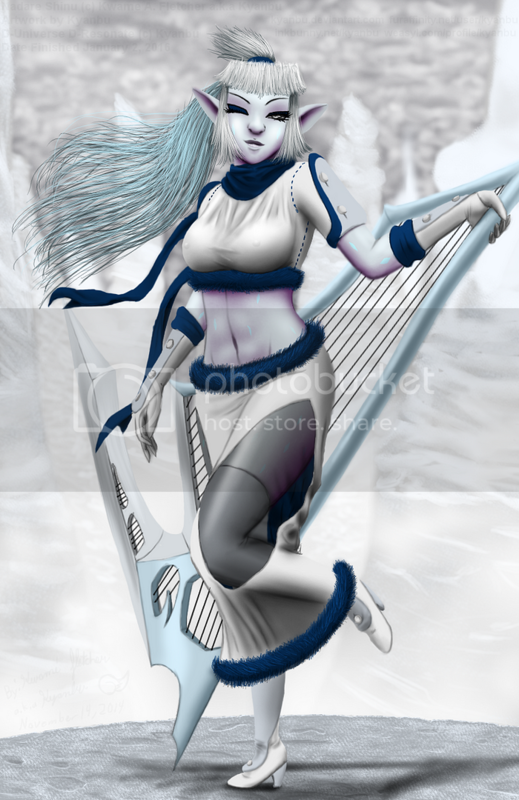 Nadare is a member of a Guild called "The Reapers". A Group composed of mostly Demons and Monsters that work for the Grim Reaper "Osiris Number" and his second in command and wife "Vita Number". All Reapers including the Grim Reaper himself (with the exception of Vita who uses a beam Scythe) each wield special weapons called "Note Scythes". Magitech Scythes with instruments built into them. These weapons are used to allow them to summon and round up lost souls and spirits such as the "Phantasms". As well as cast power "R Spells" a unique type of Musical Spells that can only be cast using a "Note Scythe" or "Note" weapon. Each member of this massive group is spread across the World of Alterra. Each assigned to a specific part of the world. Nadare being among the few Reapers operating on Lucidia Island during the Phantasm outbreak. Yes, this is related to the current Game Project "D-Resonate, Sonata of the Phantasm". Been working on the game plot some more while working on 3 Art commissions (still open by the way). While getting the dialog nice and organic has been a bit tricky. I've mainly been concerned with plugging up and fixing plot holes. Making sure that the events that happen in the game's story make sense within the game's settings and are justified well. 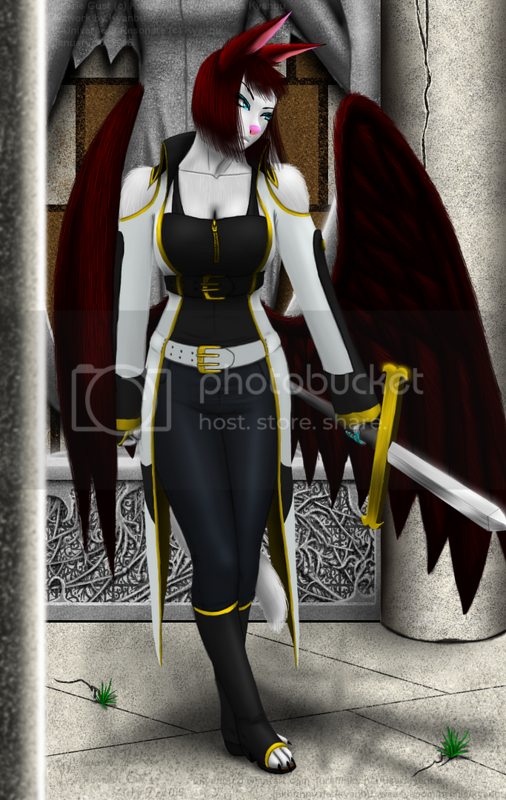 Mainly with the player character, Sarina Phantom and her role in the plot. And seeing which characters both old and new get used, and which ones get moved to the next games in the "D-Resonate" Series. Each game in the series will all take place in the same world, same universe. Just at different moments in time. This is to enable and explain away any and all cameos featuring characters from each game in the series. D-Resonate Sonata of the Phantasm is a indie 2D Platformer for PC/Mac/Linux platforms and should hopefully be ready for release by 2017. 1 of two pics from July 2015 that I went and finished. 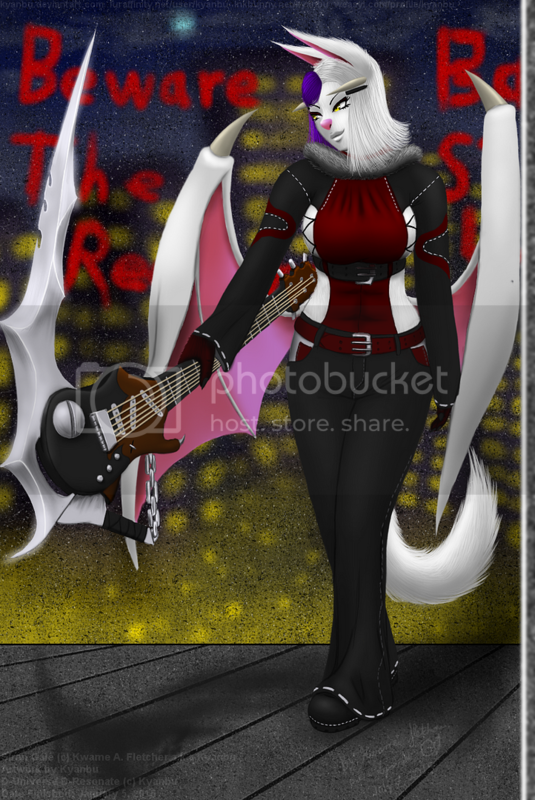 Siren Gale and her Note Scythe "Ripperrella". Valerie's will be finished next. Then it's back to the witches of the four seasons. with Summer and Vivian. No bio for this character yet, that'll come later. This is among the ones that may get cut to avoid having a cast that's way too big for whats meant to be a small game. And this more or less became Mika's new design. She's among a list of characters that may get used in the game's story. This portrait being something I started back in November 2015 and recently when back and quickly finished up. An Engineering student from "Sol City University" and a Member of "Stellar Guild", A traveling guild That's been in their family for generations. It was formerly owned by her and Dachi's late older Brother "Syanbu Stellar" before his death during a mission. Mika is an athletic, energetic young women with a love for the Sword Arts. Working to master her family's "Requiem Style" whenever she's able to, while studying to become an Engineer. She came to "Lucidia Island" with her friend "Valerie Gust" on vacation before finding her self volunteering to help out the local guilds along side "Valerie" with the current Phantasm out break. She hates it when others underestimate her abilities because of her size. And can have a bit a short temper at times when it comes to people who disrespect the Sword Arts in a world that has long since moved on to Spells, Mana Guns, and other fire arms. Often refusing to use Guns or Gunblades as a result. Despite her mother "Aurora Stellar" insisting otherwise. Mika mainly fights using swords, switching between different types of blades depending on the situation. Something, that her family's style encourages due to their desire to learn as much about other, now mostly abandoned, Sword styles and types around the world and integrate them into their own weapon designs and style, though she favors Sabers and single edge Short Swords the most. To compensate for her lack of range, Mika also relies on a small arsenal of Fire and Light Spells and attacks. While using Wind Spells to improve her movements and speed when needed. While using her agility and even stealth when needed to deal with enemies. She also makes use of a long sash she often ties to her swords to extend her cutting range. Personality Tropes: At her best, she's easy going, fun loving, very protective of her friends and allies, and full of energy. At her worst she's prideful, competitive, hot blooded, and is often too attached to using Swords, Refusing to adapt fire arms and even Gunblades with the exception of her family's Air Ship "The Star Gazer" which does use cannons. Usually she's friendly, resourceful to an extent, Wise when it comes to tech, and very loyal. 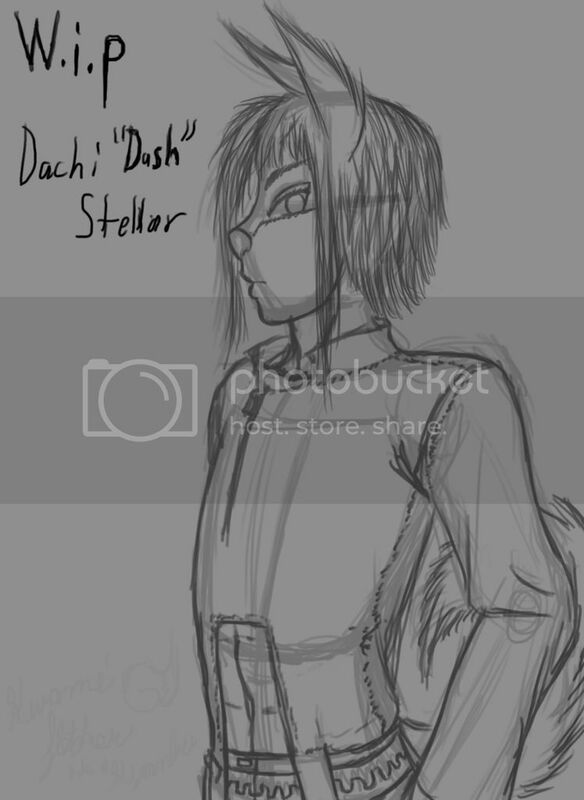 Her brother Daichi Stellar will be drawn later. I'll post a early peak of it later in the week provided I can get to it in between commissions and finishing up the witches. He's actually not a new character but rather an old character named "Dash Stellar" from the old project. I gave him a new name, a new design, but personality wise he's not much different from the original concept I started back in 2007. Well it happened. I am now completely obsessed with Gothic architecture. I cannot contain it any longer. My soul hungers for it. The feeling I get when I see these amazing structures ever since I was a kid. I love it, I crave it! I need it so! Which is why I'm really focusing on studying it and incorporating it into my designs! Black Towers and the Rest of Waking Forest must be filled with it! YESSS!!!!! We need a new emote for this feeling! Also have I been doing a decent job of trying not to be generic with these character designs so far? I feel like things are going good and was more or less wondering if that is still the case. I think you're to the point where if somebody else drew your characters they'd still be recognizable. That's just an ad hoc definition for "not generic" that I made up for this post, but it works for you then it's good enough until someone comes in with a more thoroughly considered analysis of what makes a character generic or not. Thank you for the feed back, Phil. One critique of her design that I have is (Especially when you shrink it down into a sprite), the white of her coat blends into the white of her fur. It makes her look a little bit muddled, since you can't really distinguish which part of her is the outfit, and which is the fur. You probably want something that will stand out a little bit better against her. Also, what's up with all the really faint words at the bottom of the image? That would be the water marks. Normally they're very well hidden but I ended up rushing with them on this pic. And it didn't help that this is an older CG that I finished late. One from before I switched to drawing things at around 1400x2000px. Which is why you can faintly see it this time around more clearly then usual. In response to the critic. Her coat is actually Alice Blue, a pale shade of blue. Increasing the Saturation should fix that up. Making the blue stand out more. Last edited by Kyanbu The Legend; 01-10-2016 at 11:33 PM. Been working on this bit by bit since November. Finished it up while working on a few commissions. It's special for three reasons. 2. This is the first time you're seeing parts of "Somnus Castle". Mainly it's outer wall. And in the background is a part of "Somnus Gate", the game's third stage. 3. This is the first time Tsukuyomi is actually given a first name. Yes, it's not "Lady", after all these years, I seriously never gave her a first name partially for story reasons in the old project "Mischief Knights". However for this current project, is a new Tsukuyomi (who isn't too different from the original take) and well I think it's time I gave her a first name. Here's her bio for "D-Resonate, Sonata of the Phantasm". An extremely gifted Edge Caster and (ex)leader of "Tsuki no burēdo". A clan that serves as one of "Lucidia Island's" Elite guilds. After Kazumi was stripped of her position and having 90% her powers sealed by the Clan's Consul due to her negligence in dealing with the Phantasm Out break that's plaguing the Island, among a long list of other problems. She enlisted the help of her friends "Tsunadai" and "Azumi", and traveled to "Somnus Castle" in order to investigate the out break and hopefully get her job back. Kazumi is very energetic, eccentric, and easy going with a love for nature. Often preferring to live life at hundred miles per hour without a care in the world. Though this often leads to her neglecting her position as leader of an Elite Guild. A Position she was born into. And gets her into more trouble then intended. Despite her personality, Kazumi is a combat genius with a talent for thinking on the fly. Being able to keep up with an ever changing situation. Kazumi or "Lady Tsukuyomi" as she often goes by. Mainly uses mana swords and occasionally mana guns. And relies on combining close range combat with powerful Earth, Light, Wind, Water, and Fire Spells. 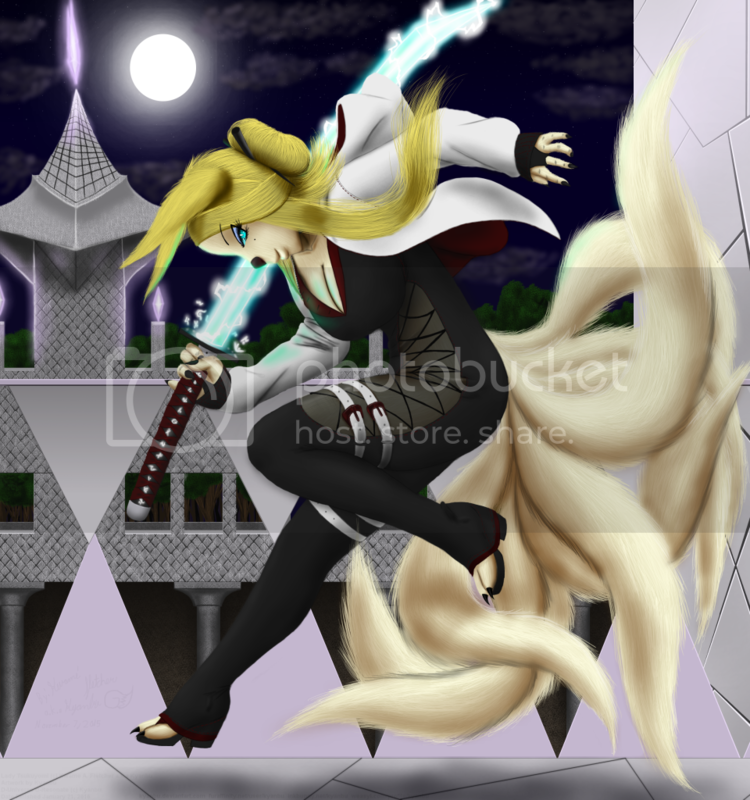 Like most Kitsune, she's able to transform into other creatures. She's also able to take this a step farther by transforming into other objects thanks to her ninth tail, though she's unable to copy machines very well. Despite her powers being mostly sealed up, Kazumi is still extremely powerful compared to most members of her own guild. Possessing all nine of her tails at a very young age by her race's standards. Much to the frustration of her clan mates. At her best, she's a fast thinker, an experienced Caster, fun and full of energy, someone who's quick to lighten the mood when things get rough. At her worst she's unfocused, annoying, and seemingly insane at times. Usually she's just hyper, fun loving, and easy going, usually laid back when she's calm, The Ace. The server time is now 07:58:27 PM.